Britney Spears may be back on top of the pop world thanks to her ongoing "Piece of Me" show in Vegas, but the singer and iconic music video artist recently attempted to branch out into a different kind of visual art — painting. Spears teased her foray into colourful canvasses via Instagram last month, and one of those previewed paintings has now sold for a hefty sum of $10,000 USD. 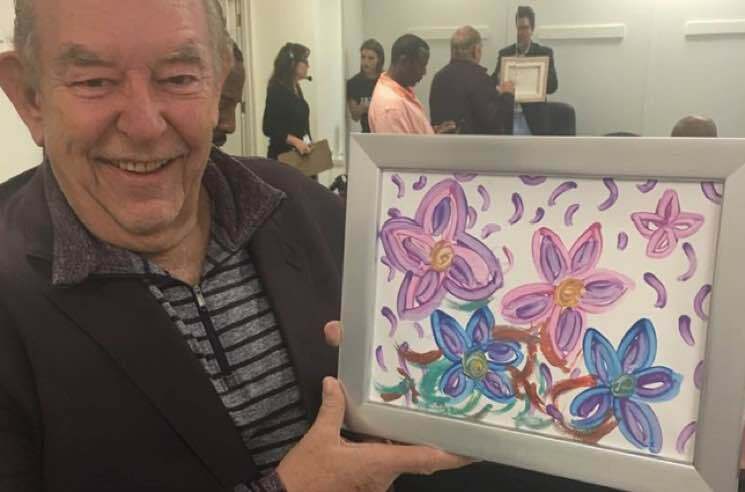 As Rolling Stone reports, the floral scene was purchased by former Lifestyles of the Rich and Famous host Robin Leach, who was also serving as the auctioneer. While it may not go down in history as a modern masterpiece, Spears' creative contribution was for a good cause. Proceeds from Leach's purchase will benefit victims of last month's Las Vegas shooting. See a photo of Leach with his brand new prized possession down below, then get a glimpse into Spears' creative process by revisiting the aforementioned Instagram clip.